Waldorf are renowned for the quality of their excellent-sounding analog filters. Now their exclusive analog filter technology can be found in a novel square box. 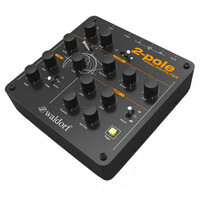 2-Pole gives the guitar player DJ or keyboardist access to the heart of the Waldorf sound with an inspiring user interface and a one-knob/one function philosophy. This entry was posted in Waldorf and tagged Recording-and-Computers. Bookmark the permalink.